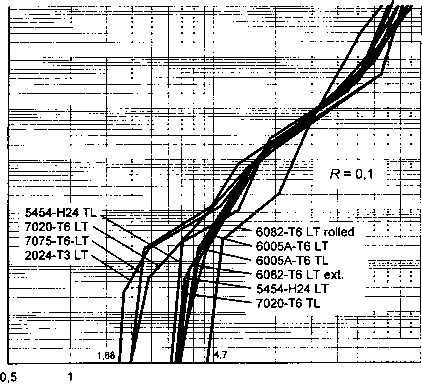 (1) A and m are obtained from crack growth measurements on standard notched specimens orientated in the LT, TL or ST direction (e.g. see Figure B.3.1) using standardised test methods (e.g. see Reference B.8.3). 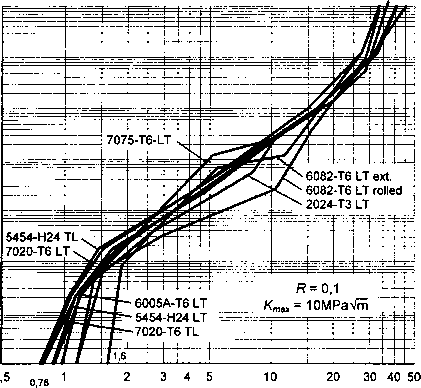 The specimen design must be one for which an accurate stress intensity factor (K) solution (i.e. the relationship between applied load and crack size 'af) is available. (2) The test entails computer controlled cyclic loading of the specimen at constant applied stress intensity ratio (Kmin/KmaxX for R° - testing conditions or at constant Kmax for Kmaxc - testing conditions (see ref. B.8.7) and accurate measurement of the growth of the crack from the notch. (3) If discrete values of crack length 'a' are obtained, a smooth curve is fitted to the data using the method specified in the test Standard. 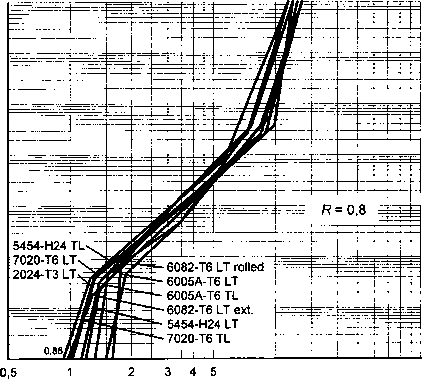 The crack growth rate, da/dN at a given crack length is then calculated as the gradient of the curve at that fa' value. (4) The corresponding value of the stress intensity factor range, AK, is obtained using the appropriate K solution for the test specimen, in conjunction with the applied load range. The results da/dN versus DK are plotted using logarithmic scales. (5) For general use, crack growth curves may be required for different R values. 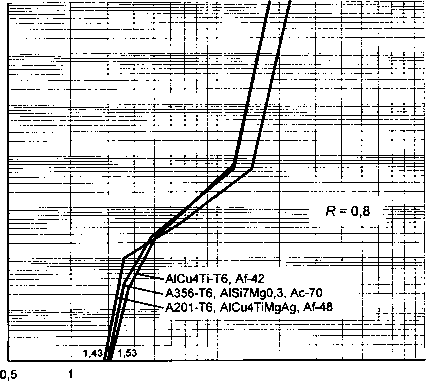 Figure B.3.2 shows a typical set of da/dN vs AK curves for the aluminium extrusion alloy AA6005A-T6 (AlMgSi0.7). 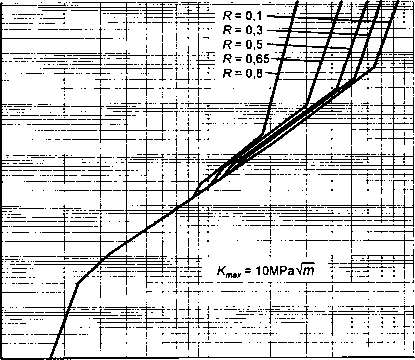 In Fig.B.3.2(a) the testing condition was constant ratio of stress intensity K^n/K^, Rc, and in Fig.3.2(b) the result of a K^0 - test at a constant Kmax of 10MPa(m)1/2 is combined with the conservative branches of the curves from Fig.B.3.2(a). This combination of the results of the Rc and the Kmax0 data is a conservative engineering approximation and can be used for the fatigue life prediction in case of high residual tensile stresses or short fatigue crack evaluations. The values of m and A for Fig. B.3.2. are given in tables B.3.2(a) and (b). (6) The assumption made in ref. 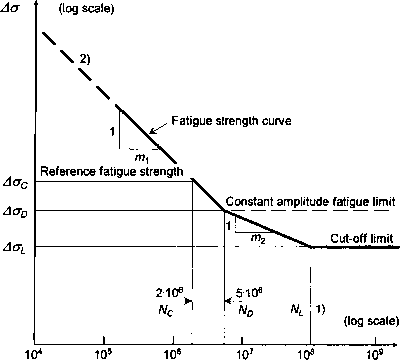 B.8.1, equation A4-11, that the fatigue crack propagation rates of metals are proportional to the cube of the ratio of the Young's moduli with respect to steel is used as a scale to compare the FCGR of different aluminium alloys. 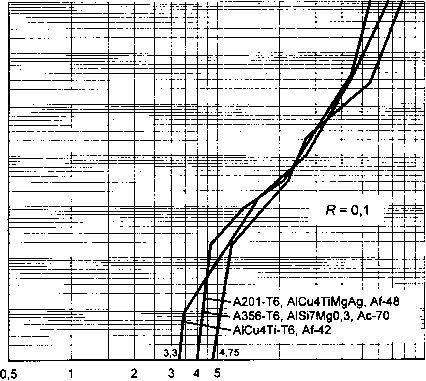 In Fig.B.3.3(a) the Rc-FCGR of wrought aluminium alloys of R=0.1 are plotted and in Fig.B.3.3(b) the corresponding data for R=0.8 are added. 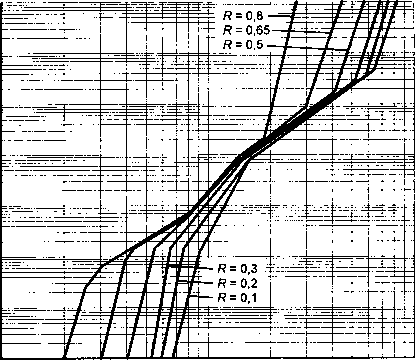 Figure B.3.4 shows the set of Rc-FCGR curves of three gravity die cast alloys at R=0.1 and R=0.8. 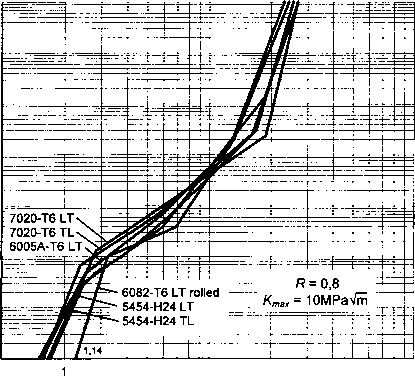 Figure B.3.5 represents the combined data of Rc and K^0 - tests of wrought aluminium alloys for R=0.1 and R=0.8. The values of m and A of the upperbound FCGR envelopes for Figs.B.3.3 to B.3.5 are given in tables B.3.3 to B.3.5 respectively. (7) Corrosive environments can effect A and m. Test data obtained under conditions of ambient humidity will be adequate to cover most normal atmospheric conditions.